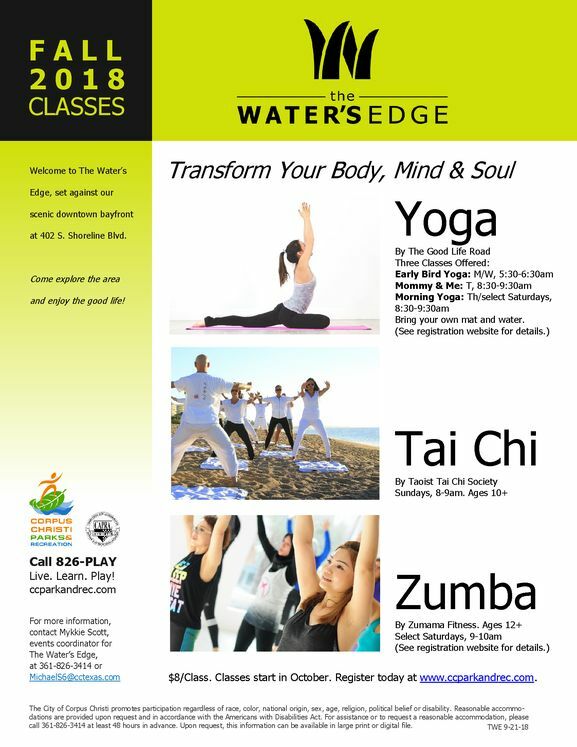 CORPUS CHRISTI, TX – The Corpus Christi Parks & Recreation Department is excited to offer a series of wellness and fitness classes this fall at The Water’s Edge in Corpus Christi’s downtown bayfront. We invite you to come out and transform your mind, body and soul with these classes for an improved and healthier lifestyle! The Water’s Edge is located at 402 S. Shoreline Boulevard. For more information or to register, call (361) 826-3414 or visit www.ccparkandrec.com (The Water’s Edge). Tai Chi Class will be offered for ages 10 and older on Sundays from 8:00 a.m. - 9:00 a.m., starting October 7. This class emphasizes balance, stillness, flexibility, peace, strength, happiness, clarity, stress relief and fun. Tai Chi is the concentration of slow controlled movements under the guidance of an accredited instructor to improve balance and posture, increase strength and flexibility, as well as improve circulation, calmness and peace of mind. Professional instruction will be provided by the Taoist Tai Chi Society. Register online for $8/class. Yoga Classes will be offered Monday through Thursday and on select Saturdays, starting October 8. You may choose from these three classes: Early Bird Yoga on Mondays and Wednesdays, from 5:30 a.m. - 630 a.m.; Mommy and Me Yoga on Tuesdays, from 8:30 a.m. - 9:30 a.m.; and Morning Yoga on Thursdays and on select Saturdays, from 8:30 a.m. - 9:30 a.m. Yoga is a practice that will help relieve stress while engaging in movements that gear towards improving balance, flexibility of muscles and tendons. You will learn how to steady your breathing, calm your mind, and strengthen your muscles. Professional instruction will be provided by The Good Life Road, LLC. Register online for $8/class. Zumba Class will be offered for ages 12 on select Saturdays, starting October 13, from 9:00 a.m. - 10:00 a.m. Zumba works several different muscle groups all at once while toning your body. It offers aerobic and anaerobic benefits by boosting heart health and maintaining a good cardiovascular respiratory system. This program incorporates interval and resistance training into a dance party. Professional instruction will be provided by Zumama Fitness, LLC. Register online for $8/class. Reasonable accommodations are provided upon request and in accordance with the Americans with Disabilities Act. For assistance or to request a reasonable accommodation, please call (361) 826-3414 at least 48 hours in advance.